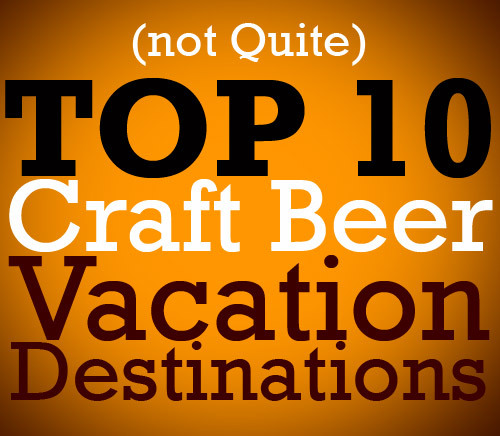 TheStreet.com released their Top 10 craft beer vacation destinations earlier this morning, and while some are slam dunks, others are head scratchers. Sure visiting Stone and Dogfish Head make sense (they have beaches! ), but Pottsville, PA? Also, The state of Wisconsin gets a nod, but Colorado is left out in the cold?! Wisconsin is a great beer state, but there’s NO WAY it’s better than a summertime visit to the Rockies! Full Sail Brewery, Hood River, Ore.
Stone World Bistro and Gardens, Escondido, Calif.
D.G. Yuengling & Sons brewery, Pottsville, Pa.
Dogfish Head, Milton/Rehoboth Beach, Del. On a scale of 1 to 10, I’d give this list a 6, as there are some must-see beer meccas here, but there are also some weak sisters and glaring omissions. What about you? How would you grade it? What would you add or subtract here? ← Wilderness Brewing: Help Our Buddies Nate and Mike Start Up Their New Kansas City Brewery! Yeah, I don’t consider Yuengling to be “craft” beer; and Sam Adams is on the cusp of becoming a macro brew in my good. It’s good to see Asheville getting more publicity on this front (although I’d prefer to keep the beer culture as our little secret here in the mountains). Yeah, I was gonna knock the Asheville pick but then I recalled all the “Best Craft Beer City” wins of late – must be something good happening there! Well, I go drinking there, so maybe they know about that. Its an online poll….kinda like American Idol. I’d take its classification with a grain of salt. I wasn’t impressed. Yeah, those are easy to game, but it shows that there’s a bunch of folks in the area who care enough to click – a good sign! They put next to zero effort in to making this list. No publicity is bad publicity. You’re giving them hits. I know Asheville is a great beer city, but that picture of Highland Brewing that they chose doesn’t exactly scream “fun”. Stone is great, but very pricey and the food is just ok. I agree, the Asheville picture is quite “WTF? !” – nothing like a warehouse vacation! Any time your list has a brewery and a state as if they are similar destinations, you are an not working hard at your job. Portland, Maine instead of Portland, Oregon?! Nothing from Colorado?!! No way – interns know their beer! Portsmouth, NH > Portland, ME. Many places are > than Portland, ME. My interns brew their own beer. Nice! Those are the dudes I suspect. I don’t think I’d make it all the way to Harrisburg!! I’m in! Where does the Beer & Whiskey Bros tour bus meet and when do we leave?? The alternative to this road trip is just to hang in Philly from 6/3 to 6/12 and all these brewers will come to us for Philly Beer Week. You coming down the Turnpike for any Beer Week Philly Phun? Hmm…not planning on it…stoopid family and career!! You’re just not dedicated enough! It takes sacrifice to be good at your avocation. Boise, Meet me at the corner of State and 5th. If you’re late, I’m going home! Avocation? I think the word you are looking for is addiction. There are a lot of brewers I’d like to see on a beercation. Sierra Nevada would pretty middle-of-the-pack. That was the very first one that jumped out at me. I like Yuengling as much as the next guy but Pottsville? As a vacation destination? Uh, no. Also, I second Randy’s roadtrip suggested above!